The Fireye EP Programmer Modules are used with the Flame-Monitor Burner Management Control System (P/N's E110 and E100). They provide start-up programming, safe start check, and flame monitoring supervision. They insure open damper high fire purge interlock (EP100 series only), proof of low fire position and fuel valve end switch safety checks. A running interlock circuit on the Flame-Monitor system constantly monitors the limit switches, air flow switches, and fuel pressure switches through the programmer. The EP programmer modules will de-energize all fuel valve circuits with 4 seconds (max.) following a flame failure (2 seconds for the EP165, EP166, EP265), or at the end of the pilot-trial-for-ignition period if no flame is detected. A modulator (firing rate motor) circuit is provided on the EP100 andEP200 series programmers. The EP300 series programmers do not provide a modulator circuit. The EP programmers provide a Check-Run switch to stop the control in its firing sequence at any time (except MTFI) to aid in set-up, start-up, and check out of the burner and its associated interlocks. The EP programmers offer the following selectable functions: increase purge timing, require the air flow switch (terminals 3-P) to be open at the start of the operating cycle, recycle or non-recycle operation (EP300 series only), and intermittent or interrupted operation of terminal 6 (EP300 series only). The EP programmers include an RJ45 style connector to interface with the ED510 display module (mounted local or remote) and two (2) RJ style connectors to connect to an E500 communication interface wired in a multi-drop configuration. The EP programmers store the burner cycle and on-time history, as well as lockout history (with burner cycle and burner hour time stamp). EP160 30 Sec. Purge, 10 & 15 Sec. TFI, 4 Sec FFRT, Non-Recycle Modulation. EP161 30 Sec. Purge, 10 & 30 Sec. TFI, 4 Sec FFRT, Non-Recycle, Modulation. EP165 30 Sec. Purge, 10 Sec. TFI, 2 Sec FFRT, Pilot Stabilization, Non-Recycle, Modulation. EP170 30 Sec. Purge, 5 & 10 Sec. TFI, 4 Sec FFRT, Early Spark Termination, Non-Recycle, Modulation. EP100F Selectable purge, selectable TFI, 4 Sec FFRT, Non-Recycle, Modulation, French language. EP100S Selectable purge, selectable TFI, 4 Sec FFRT, Non-Recycle, Modulation, Spanish language. EP260 30 Sec. Purge, 10 & 15 Sec. TFI, 4 Sec FFRT, Recycle, Modulation. EP261 30 Sec. Purge, 10 & 30 Sec. TFI, 4 Sec FFRT, Recycle, Modulation. EP265 30 Sec. Purge, 10 & 15 Sec. TFI, 2 Sec FFRT, Pilot Stabilization, Recycle, Modulation. EP270 30 Sec. Purge, 5 & 10 Sec. TFI, 4 Sec FFRT, Early Spark Termination, Recycle, Modulation. EP200F Selectable purge, selectable TFI, 4 Sec FFRT, Recycle, Modulation, French language. EP200S Selectable purge, selectable TFI, 4 Sec FFRT, Recycle, Modulation, Spanish language. EP380 30 Sec. Purge, 5 & 10 Sec. TFI, 4 Sec FFRT, Recycle, No Modulation. EP381 15 Sec. Purge, 5 & 10 Sec. TFI, 4 Sec FFRT, Recycle, No Modulation. EP382 0 Sec. Purge, 5 & 10 Sec. TFI, 4 Sec FFRT, Recycle, No Modulation. EP390 90 Sec. Purge, 5 & 10 Sec. TFI, 4 Sec FFRT, Recycle, No Modulation. EP300F 4 Sec FFRT, selectable purge, selectable Recycle, Non-Recycle, No Modulation, French language. EP300S 4 Sec FFRT, selectable purge, selectable Recycle, Non-Recycle, No Modulation, Spanish language. EP Style Programmers offer selectable, purge timings and selectable Prove Air Flow (3-P circuit) Open To Start. 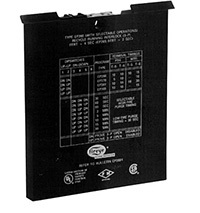 EP100 and EP200 series programmers provide an additional 30 second low-fire purge. EP380, EP381, EP382, EP390 offer recycle/non-recycle operation.